Rebel high flyers prepare to dissent - Liberal MPs Petro Georgiou, Judi Moylan and Russell Broadbent sit in the crossbenches, waiting for the moment that their vote counts, having 'crossed the floor' when the House Bells begin ringing for the vote of the Designated Unauthorised Arrivals Bill 2006. Thanks to Chris Lane and the Sydney Morning Herald. The last week of June 2006 was indeed a remarkable week all around in Federal Parliament. Government MP's pursued Liberal leader Malcolm Turnbull about the use of a fake email to smear Prime Minister Kevin Rudd. Meanwhile, the Migration Amendment Bill 2009, intended to Abolish the Detention Debt held against thousands who come to our shores to seek protection, was up for debate. "God forgive me that I was part of the parliament that did that, which caused so much distress to so many families over such a long period of time." "It was wrong in the Hawke years and it was wrong in the Howard years, and the wrong will be righted today. The debts against some of our most vulnerable people will be removed, will be waived. It is the Australian thing to do. It is about fairness, justice and rightness." Perhaps we should call these expressions of conscience in speeches by Petro Georgiou, Russell Broadbent, Judi Moylan and Danna Vale - all MP's for the Liberal Opposition party and formerly backbenchers in the Howard government - the Atonement speeches. As Mr Broadbent told ABC-TV's Breakfast program the next day, there were a lot more Liberal MP's who were quietly supporting the Bill, contrary to the official Liberal party line - to end the cruel and unnecessary practice of charging people for the cost of locking them up. Many more would have been prepared to cross the floor and vote for the Bill, if it had come to that, he said. 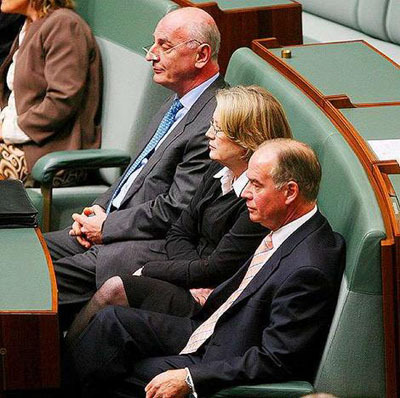 This page lists the full House of Representatives speeches by Liberal MP's Petro Georgiou (Kooyong), Russell Broadbent (McMillan), Judi Moylan (Pearce) and Danna Vale (Hughes). Three media reports, from The Age, the Sydney Morning Herald and ABC News provide some of the context. 9 June 2008: First jail them, then send the Bill: Australia bills refugees for jailtime - Australia has the audacity to first jail 'unannounced boat-using asylum seekers' who use their international right to 'seek asylum in any country' (art 14, Declaration of Human Rights), and then, upon their release sending them a Bill for the cost of just having jailed them without having committed a crime - a jailing, often for years. A BILL to abolish detention debts for refugees are set to pass the Senate and the Coalition will splinter over its hardline position in the lower house. Almost $9 million in debt will be lifted from as many as 474 refugees, who are charged for the cost of their own detention. Labor announced in March its plan to cancel the debts. Yesterday it won the backing of both independent cross-benchers. The Family First senator, Steve Fielding, was unflinching. "We must show greater compassion to our refugees and I am 100 per cent opposed to any policy that would leave refugees with a debt hanging over their head," he said. An obligation for criminal detainees to reimburse the Government remained. Illegal fishermen and people smugglers would continue to be billed for transport, accommodation and food costs associated with being locked up - $125.40 a day. Senator Nick Xenophon also criticised the existing set-up. "It's petty, it's ill considered and he'll be voting with the Government," Mr Xenophon's spokesman said. The five Greens Senators have long supported the abolition of detention debt. South Australia's Sarah Hanson-Young said they were "a flagrant way of adding insult to injury to those who come to Australia seeking our assistance and protection". Recent figures showed the administrative costs of chasing the debt were greater than the 3 per cent of debt ever recovered. Further, the burden of having a debt was detrimental to the mental health of former detainees and restricted their capacity to travel. "Debt recovery under the existing system is so low as to be virtually ineffective," the Parliamentary Secretary for Immigration and Citizenship, Laurie Ferguson, said this month, adding that most debts were eventually waived. "The Commonwealth considers that it has a moral, rather than a legal, obligation, to extinguish the debt." The voting intentions of senators became clearer yesterday, with Coalition infighting on the issue set to intensify in the lower house when debate starts today. As many as 15 Opposition members were prepared to speak out against the bill and moderates Petro Georgiou, Russell Broadbent, Judi Moylan and Dana Vale reserved the right to cross the floor. Detention debts have proved problematic for the Coalition as it attacks the Government for "softening" its policy. Compounding the delicacy of the issue is immigration spokeswoman Sharman Stone's seat on a committee that supported the changes which she said yesterday would help people smugglers attract more clients. "We don't believe that we need any more signals to people smugglers to make offers to asylum seekers even more likely to be taken up," she said. The Victorian Liberal Judith Troeth was prepared to abstain from a vote in the Senate, giving the Government some breathing room on numbers needed to see the laws pass. Dr Stone denied the party was split. "The Liberal Party is a broad church," she said. "We don't throw people out of the party who have a different opinion on some issues." Last night the Government said it had intercepted another boat of asylum seekers near Ashmore Reef. The 49 passengers and four crew were being taken to Christmas Island. The Opposition avoided the embarrassment of its MPs crossing the floor of Parliament today over asylum seekers. Liberal MPs Petro Georgiou, Danna Vale, Judi Moylan and Russell Broadbent all publicly indicated they were prepared to break ranks with their colleagues and vote in favour of the Government's bill abolishing detention debts accrued by asylum seekers. But when it came to a vote in the House of Representatives the bill passed on the voices. Since the Opposition did not raise objections, there was no requirement for a formal vote. Immigration Minister Senator Chris Evans described that as an act of cowardice. Mr Broadbent said he was ashamed that 17 years ago he was part of the Parliament that supported the then Labor government's mandatory detention and billing policies. "God forgive me that I was part of that Parliament that did that, that caused so much distress for so many families over such a long period of time," he said. "It was wrong in the Hawke years, it was wrong in the Howard years, and the wrong will be righted today." The Coalition decided to oppose the Government's bill to stop making asylum seekers liable for the cost of their detention. But the four Liberals said they could not support it and Mr Broadbent said he understood the seriousness of ignoring the party-room vote. He recalled a story from the early 1990s - some critical comments he had made about party policy wound up in print. Mr Broadbent said he was summoned to Liberal Party headquarters for a verbal shellacking by someone who now was standing shoulder-to-shoulder with him on the Parliamentary floor. "And I was called to Victoria, to 104 Exhibition Street, to the state director's office, where for one hour I was thrown around that office, and what he was talking to me about was party unity and sticking behind the leader, doing the right thing," Mr Broadbent said. "Do you know who that state director was? Have you got any idea who that state director was? That state director was Petro Georgiou." Independents Rob Oakeshott and Tony Windsor said they would also support the bill, and Mr Windsor appealed to the Government to resist the temptation to capitalise on the Coalition's disunity. "I know that Government will probably use this as some sort of wedge that the Leader of the Opposition has lost control of his people," Mr Windsor said. "If the Government runs the line that this is all about Malcolm Turnbull losing control of his people, I think it will be in the communities' eyes to the detriment of the Government." But none of the four dissenters crossed the floor in the end. The bill was passed on the voices, avoiding the need for a formal vote and the Opposition and Mr Turnbull were spared the sight of MPs crossing the floor. Immigration Minister Senator Chris Evans says the Opposition is in disarray. "They're not even prepared to have a division and stand there because they know it will just highlight again that they've become dysfunctional," he said. "They're in total disarray. That's three issues this week where they haven't been able to operate as an effective political party and many members in open rebellion against Malcolm Turnbull's leadership. "It is really, I suppose, the final act of cowardice in this debate, that they refuse to call a division." MPs still may cross the floor in the Senate, when the bill is debated in August. SILENCE from the Coalition allowed Labor's plan to abolish the detention debt to pass through Federal Parliament's lower house yesterday. After intense debate, a proposal to stop billing refugees for their mandatory detention passed on voices, negating a formal vote. Opposition hardliners were either absent or fell silent while Liberal backbenchers Petro Georgiou, Judi Moylan, Danna Vale and Russell Broadbent gave a vocal "aye" in favour of the bill. For Mr Broadbent, dissenting from his party's insistence that the debt regime stay was a search for redemption. "God forgive me that I was part of that parliament that did that," he said. Under a policy started by Labor's Gerry Hand in 1992, people seeking protection in Australia were detained and charged for their upkeep. "That caused so much distress to so many families over such a long period of time. It was wrong in the Hawke years. It was wrong in the Howard years. And the wrong will be righted today," he said. Less than 3 per cent of detention debts were recouped and while most had been waived or written off, $8.9 million was outstanding. Independents Tony Windsor and Robert Oakeshott also voted with the Government. The Immigration Minister, Chris Evans, said cowardice had prevented a formal vote. The immigration parliamentary secretary, Laurie Ferguson, said the Opposition spokeswoman, Sharman Stone, had backflipped on the issue, and he questioned her integrity. Dr Stone sat on a committee that recommended the changes she had since opposed, claiming it would encourage people smuggling. Smiling under fire yesterday, Dr Stone chatted with colleagues until the assault finished. But as one tactical problem for the Opposition was left to rest until August, when the detention debt legislation is debated in the Senate, another took its place. More immigration legislation amendments were tabled in Parliament yesterday as part of the "softened" policies announced by Labor last July. The promises that no children would be held in detention, and that detention should be for the shortest practicable time, were unanimously supported by Liberal MPs who sat on a migration committee. Mr GEORGIOU (Kooyong) (12.59 pm)--I speak in support of the Migration Amendment (Abolishing Detention Debt) Bill 2009. It is a bill that takes another step towards closing a dark chapter in our history. This dark chapter is about the incarceration of men, women and children behind razor wire in isolated locations. It is about the imprisonment of innocent people for periods longer than criminals convicted of serious felonies. It is about the demonisation of people fleeing persecution. It is about the denial of psychiatric attention to sick people to whom the government owed a duty of care. It is about conditions in detention centres that traumatised not just the detainees but also their guards. It is a chapter about lip sewing and suicide attempts. It is a chapter of harming people fleeing persecution who asked for and were entitled to protection in our country. This chapter is a stark contrast to the openness and compassion of the one that preceded it. Some members will recall 1976 when our country was faced by the unprecedented challenge of Indochinese boat people. Two thousand of them landed on our shores in a handful of years. Some people proposed that we should put them into detention centres or push the boats back. The Fraser government, supported by the opposition, rejected this. We accepted the Indochinese refugees into our society and we participated in an international effort which resettled almost 1.5 million people from Indochina across the world with about 130,000 of them coming to Australia. The sense of responsibility and compassion that prompted this was a tribute to the Australian people and to our leaders. History shows that our nation benefited. Hand supported his proposals with his usual blend of vivid anecdotes about the wickedness of the boat people and their sinister manipulators (Chinese tongs this time) and attacks on the self-righteous attitude of the churches and the dogooders. Yes, Mr Deputy Speaker, it is an odious policy, but it has to be recognised that it was introduced by a Labor government. If we are going to try to make things right on a bipartisan basis, we cannot distort the facts. We have to confront the reality that both sides of parliament were involved individually and collectively. All of Hand's harsh measures were at the time supported by both sides of the House and the succeeding coalition government maintained Labor's measures and toughened them. The Pacific solution was established, Australian territories were excised from the migration zone and boat people who were found to be genuine refugees were given only temporary protection visas in contrast with the established history of Australia. All of these measures were supported by the coalition parties and Labor. I can attest that these measures disturb some members on both sides. I think that does need to be said. But it also needs to be said, and it cannot and should not be denied, that we did go along--we all did. The votes in the parliament show this. Going along had its consequences. Vulnerable men, women and children were harmed by the legislation we voted for and by the practices and abuses that it spawned. But by 2005 the recognition was grown in both the parliament and the community at large that our treatment of people arriving by boat seeking sanctuary was cruel and contrary to Australia's best values. The coalition government was persuaded that the harshness with which the people seeking sanctuary were treated should be ameliorated and the reforms were supported by the opposition. It was agreed that children were only to be held in immigration detention as a measure of last resort, that all families with children were to live in the community without security supervision, that the Immigration Ombudsman would independently review and report on all cases of long-term detainees and the permanent protection visa applications by temporary protection visa holders would be expedited and treated favourably-- and they were. There is no evidence to suggest that the abolition of Temporary Protection Visas has resulted in increased unauthorised boat arrivals. Rather, an examination of the TPV data indicates unauthorised boat arrivals increased following the introduction of TPVs. But beyond this there is the record of the 353 people who tragically drowned when the boat designated 'suspected illegal entry vessel X' sank in October 2001 on its way to Australia. We will probably never fully know who was on SIEVX or their motives. The AFP has testified that it had a list that could not be disclosed for operational reasons and may not be accurate, but what has been established beyond doubt by journalists' investigations--and this is on the public record--is that passengers on SIEVX were trying to reunite with their spouses. Here are just some of the tragic cases. Ahmed al-Zalimi was living in Sydney on a TPV, which precluded him from applying for his family to join him. His wife and three daughters boarded SIEVX to be reunited with him. His three daughters drowned. Mohammed al-Ghazzi was living in Perth on a temporary protection visa. He lost a total of 15 family members on SIEVX, including his wife and three children. Hazam al-Rowaimi was living in Victoria on a temporary protection visa. He lost his wife, four children and mother. Haidar al-Zoohairi was living in Sydney on a temporary protection visa. He lost his wife, two children and brother-in-law. SIEVX was a tragedy of major proportions and its passengers attest to the unintended consequences of the temporary protection visa. I welcome the return to giving people who have been found to be genuine refugees permanent protection with the ability to have their family join them. There is no way that temporary protection visas--or any variation of them--should be reintroduced. Nonetheless, I welcome this abolishing detention debt bill as a further step in closing this dark and distressing chapter in our history. This bill terminates the law that charges people seeking refuge in Australia the costs of their mandatory detention. The most obvious reason for repealing it is that it has totally failed to achieve its objective. The stated objective of charging people in detention was that asylum seekers should pay for the costs of being detained. I have searched assiduously to find a deterrent objective but unfortunately I have not been able to discover one--at least not on the public record. Since the policy was initiated, only four per cent of the costs have been recovered. Over the last four years, $139 million or 81 per cent of charges have been waived or written off, mainly by the coalition government, because it was impractical or uneconomical to recover the charges. This year it is estimated that it will cost $709,000 to collect $573,000. There is simply no rational basis on which continuing the charges can be defended. This is not surprising. How could Gerry Hand and his department have ever believed that refugees could repay these charges? In some cases refugees owe hundreds of thousands of dollars when they are released. I say again that this policy has failed abysmally to achieve its stated objectives. ... a barrier towards refugees fully integrating into the community, and continues to put significant pressure--both emotionally and financially--on those people who have already experienced so much trauma and uncertainty in their lives. The policy reinforces and prolongs emotions such as shame and guilt which are common effects of torture and trauma, and impedes the recovery of survivors. This has been replicated in any number of other reports. At the end of last year, having considered all the evidence, the Joint Standing Committee on Migration was unanimous in its recommendation that the legislation be repealed. This bill effectively implements the recommendations while still charging people smugglers and illegal fishers. In my view, there is another fundamental reason for ending the detention charges. It is because imposing these charges is part of the process of dehumanising people seeking refuge, part of the way they have been presented as being worse than the worst criminals. Do we charge drug dealers, serial paedophiles, sadistic murderers and multiple rapists the costs of their detention? No, we do not, whether or not those criminals are Australian citizens, noncitizens, illegal immigrants or Uncle Tom Cobley. The charging of people who arrive on our shores seeking protection for the costs of their detention is part of the way in which we have demonised them and presented them as being worse than criminals. And this image, I believe, underpins the abuses which have been discovered by inquiries into our mistreatment of people in detention. The fact is that throughout history people have fled their homes to escape persecution and violence and to seek safety where they can--across the border or across the ocean. Since 2005 we have moved to return humanity to our treatment of refugees. That process is not, in my view, complete. At the present time Australia is confronted, as are many other countries, with an increase in people seeking refuge on our shores. The United Nations High Commissioner for Refugees in his most recent report shows that the number of individual claims for asylum worldwide rose for the second year in a row by 28 per cent to 839,000. Developed countries like Australia do attract asylum seekers, but the fact is that 80 per cent of the world's refugees are hosted by developing countries: Pakistan, Syria, Iran and Jordan. Amongst the developed countries, the US received 49,600 applications for asylum; France, 35,400; Canada, 34,800; the UK, 30,500; and Italy, 30,300. Australia received--and this is taking together boat arrivals and plane arrivals-- ,500 asylum claims. That is 0.5 per cent of the total, and almost all of them did not arrive by boat. The number of people seeking asylum has resulted in some calling for a return to harsh policies or for an end to the amelioration of the harshness of policies, which is still there. We have experienced the cruelty and harm that such policies have caused. We should not contemplate returning to them again, and I will not do so. The members of this House are legislators in a 21st century Australia--a civil society, a precious society, a country under the rule of law which is generally just and equitable. We are also human beings, with good and bad instincts, and we are capable of making good and bad decisions. Our fellow citizens have put us into this place, temporarily, so that we can pursue decent public policy outcomes for our society and legislate decent law. No advanced society should allow on its statutes a law which so degrades and humiliates fellow human beings who are legitimately calling on our protection. We have an obligation to our own generation and to future generations to support this bill. I will support the bill and I commend it to the House. Mrs MOYLAN (Pearce) (5.53 pm)--I have always deeply felt that at the core of any public policy should be the preservation of human dignity and human life and that placing these as first principles of public policy does not, in any way, detract from our responsibility in this place, particularly in relation to refugees. That responsibility is not diminished by undertaking those first principles, by government or by opposition benches, to implement and insist on a strong border protection policy. Citizens have a right to expect the government will maintain a strong border protection policy and to keep the country safe from foreign invasion, to protect Australian territorial waters and industrial interests. The difficulty with this issue rests with the ability to separate two key issues. The first is the protection of our borders and the second is the way we treat refugees or asylum seekers when they arrive in our territories and are found to be genuine refugees. Too often these issues become clouded in the miasma of political debate, which leads to demonising people who arrive by boat seeking asylum. This process is aided by the mantra that they are illegal entrants and queuejumpers. The rejoinder is that Australia has long been a signatory to the international convention on refugees and there are strict guidelines to determine the validity of a claim for refugee status. In many conflict zones, queues do not exist and there are few stopping- off points between some of the conflict zones and Australia. Malaysia or Indonesia are the most likely destinations, but these countries are not signatories to the international convention on refugees and they have no regulatory framework to protect them. Indonesia is working towards signing the refugee convention in 2010. However, there is also a need for the development of a regulatory framework and that could take some time. Many important changes to the immigration detention policies have been made in recent years, as my colleague the member for Kooyong very eloquently outlined to the House earlier today. These changes were made to ensure that the policy is administered more humanely. What we are debating here tody is a remnant of legislation that seeks to abolish billing refugees for accommodation in mandatory detention. It is important to stress, though, that the change to the act does not apply to illegal fishermen or to people smugglers who profit from their nefarious activities. They will continue to be billed. Australia is the only country in the world which charges innocent people the cost of incarcerating them. This is not a distinction that is deserving of much merit. No-one can condone the action of people smugglers. They trade on the desperation of people fleeing war, political persecution or religious intolerance, in the main, and there is a view that by maintaining this policy of charging it would deter further boats from coming to Australia and would send a signal to people smugglers. The fact is that this measure was implemented through a change to the Migration Act in 1992 to the effect that all unlawful noncitizens would bear primary responsibility for the cost of their detention. It was implemented, as one of my other colleagues said, under a Labor government and was carried on under the coalition. It was never intended to act as a deterrent, nor has it been demonstrated that it has any deterrent value. In fact, on the back of the Iraq war we saw a substantial wave of boat people arrive in 2001. The boat arrivals are more likely to be linked to the escalation of war and conflict around the globe than with our domestic policy. Moreover, these waves should be kept in perspective and a few boatloads of people cannot be construed as a threat to national security, despite the hysterical headlines announcing every new boat arrival. The ensuing letter to the editor pages in our newspapers express concern that the new arrivals may be terrorists, may introduce unwanted diseases or are just economic refugees, and the more extravagant raise prejudices against people of particular religious beliefs. The fact that all people arriving by boat seeking refugee status are placed in detention until health, security and identity checks are complete should allay most reasonable fears. With a combination, though, of hysterical headlines and at times disingenuous debate, it is unsurprising that there is public disquiet about these new arrivals. The United Nations High Commissioner for Refugees, Mr Richard Towle, who gave evidence before the Joint Committee on Migration, did say that it would be in the interests of refugees, advocates and the public to have greater clarity and transparency of the assessment process and of the regulatory and legislative framework. This, he argued, is particularly so with the regular arrivals who come with false documents or no documentation. I would certainly support any action which would make these processes more transparent and open to public scrutiny because it would remove some of those unwarranted fears. To further address security fears, of the 5,986 security checks on boat arrivals in 2000 and 2002, the Director-General of the Australian Security Intelligence Organisation reported that no individual had been assessed as a security risk and, in 2004-2005, ASIO reported that two unauthorised arrivals, from a total of 4,223 assessments, gave rise to some concerns. I think that included all unlawful arrivals, not just those by boat. The escalation of violence in Afghanistan, recent troubles in Sri Lanka and continuing brutalities in Burma are the main reasons for the stark choices asylum seekers confront: facing terror in their homelands or risking the chance of gaining passage on leaky boats. We witnessed the risks and the ensuring tragedy recently, when a boat carrying a number of refugees caught fire. The loss of life and serious injuries that followed shocked this nation. The hysteria about the number of arrivals should be seen in the context of those current adverse events and in comparison to the numbers received by some of our closest allies. Indicative of escalating conflicts in many countries around the globe, refugee numbers increased in 2008 by 12 per cent worldwide. This followed a 20- year low in the number of refugees worldwide in 2006. The increase in 2007 came largely on the back of the Iraqi conflict and in 2008 it was driven by escalating troubles in Afghanistan and Somalia. The UNHCR reports that Australia is ranked 69th in per capita terms for hosting refugees, representing 0.2 per cent of the global total, but Australia is ranked first for its official refugee resettlement program, which is indeed very generous. We can be very proud of that record. In 2008, Australia recorded approximately 4,700 asylum claims, which is well below the 2000 and 2001 figures of 13,100 and 12,400 respectively. By contrast, Canada, a country of about 34 million people, registered 36,900 claims in 2008, an increase of 30 per cent on the 2007 claims. I have worked over the past several years with my colleagues the member for McMillan, the member for Kooyong and others to change the Migration Act, including the release of families with children from detention centres, a reporting system to parliament by the Immigration Ombudsman at six-monthly intervals regarding people who are held in detention for lengthy periods and improved assessment processes to reduce the time people spend in detention. I welcome the bipartisan agreement of the Joint Standing Committee on Migration which, amongst other measures, recommended that the practice of charging refugees costs incurred while in immigration detention be discontinued. The Committee recommends that, as a priority, the Australian Government introduce legislation to repeal the liability of immigration detention costs. The Committee further recommends that the Minister for Finance and Deregulation make the determination to waive existing detention debts for all current and former detainees, effective immediately, and that all reasonable efforts be made to advise existing debtors of this decision. The cost of detention is about $125 a day. It applies to detention centres, residential centres and community detention. Spouses and dependent children are also liable for the charges. A one-year detention period would result in a charge of about $45,000. Given that many people were held in detention for periods of two to five years, the charges are very substantial, particularly in the case of a family. In one case outlined in the report, the family had incurred a debt of $340,000. According to the Department of Immigration and Citizenship, the total amount of debt recovered since 2004 has been low, at between one and four per cent. This year, the estimated cost of administration will be higher than the debts collected. There were many submissions critical of this policy, with one witness branding it 'manifestly harsh and unjust'. I have witnessed firsthand the trauma this policy causes asylum seekers, who barely out of detention receive a substantial bill which they have little hope of paying in the foreseeable future, if ever. It is distressing for them because they do not know that there might be mechanisms within this parliament to waive these fees unless somebody in the community who knows about it tells them. Many people in this place, I hazard to say, do not know about that. On release, asylum seekers often find work that is poorly remunerated. The cumulative effects of years of trauma take their toll and further add to the difficulties many confront when released. The dishonour of knowing that they cannot pay any time in the foreseeable future causes a loss of dignity in people who have been accustomed to honouring their commitments. In any event, it contributes to the financial hardship faced by many refugees. It is very detrimental to a person's attempt to settle into life in a new country. The evidence clearly indicates that the imposition of detention costs is an extremely harsh policy and one that is likely to cause significant hardship to a large number of people. The imposition of a blanket policy without regard to individual circumstances is inherently unreasonable and may be so punitive in some cases as to effectively amount to a fine. The committee agrees -- and the committee is a bipartisan committee -- that it is a serious injustice to charge people for the cost of detention. This is particularly so in the case of unauthorised arrivals, many of whom have spent months and years in detention ... the committee therefore recommends that it be abolished and all existing debts be waived. Given that not one but two bipartisan committees have strongly recommended that the policy be discontinued, I have to say that I am extremely disappointed that once again politics are played at the expense of some of the world's most vulnerable people. In summary it is clear that the legislation which imposes a daily charge for asylum seekers being held in detention does not prevail in any other jurisdiction other than Australia. It does not apply to criminals or those held in other forms of detention. It has no demonstrated deterrent factor. It is a debt that is rarely collected. It hampers the resettlement of refugees. And it was the subject of two bipartisan inquiries, with unanimous recommendations to discontinue the charge. Mr Deputy Speaker, I suppose you could further add to that list the fact that, from this year's figures, it is costing more to administer the collection of the debt than the income that it is deriving. Given the thoroughness of the reports, I believe we should be supporting this legislation. It is time to move away from the dehumanising of people arriving in this country in boats seeking asylum. As someone said about recent boat arrivals, 'It's not a flood; it is a trickle.' Ironically, while we are worrying about these few loads of boat people arriving, we are ignoring the real border protection issues. In Western Australia, we have the vast coastline of the Indian Ocean. It is home to immense gas reserves and it is rich in minerals, yet I believe this coastline does not receive the kind of attention or the protection that it merits. We should turn our minds to a serious debate about the real national security issues that effectively protect our borders. Let me conclude by acknowledging the work of the standing committee on migration and the earlier work by the committee on legal and constitutional affairs for their thorough consideration of detention policies and the very careful considerations that have led to the legislative changes that are proposed in this bill. I support the changes to the Migration Act to abolish detention charges for refugees. This is one of those rare occasions since I was elected to this place in 1996 that a recommendation made in a report from one of the many committees upon which I have served is actually the subject of a bill in this chamber. Although I note that there are many hardworking and diligent public servants who take note of our committee reports and recommendations, and often put in place those recommendations that can be implemented without need of legislative amendment-- and I want to recognise their efforts--I do welcome the opportunity to actually see a recommendation from a committee put into legislation. The purpose of this bill is to amend the Migration Act 1958 to remove the requirement that certain persons held in immigration detention in Australia be liable for the costs of their detention. At the same time, the bill will also extinguish all immigration detention debts outstanding at the time of commencement of this legislation. In the course of many public hearings across Australia, our committee heard evidence from many individuals as well as many highly regarded service providers within the community. These organisations included A Just Australia, Amnesty International, the Asylum Seekers Centre, the Australian Red Cross, Balmain for Refugees, the House of Welcome, the Mercy Refugee Service, the Immigration Detention Advisory Group, the Brotherhood of St Laurence, the Castan Centre for Human Rights Law, the Detention Health Advisory Group, the Hotham Mission Asylum Seeker Project, the Law Institute of Victoria, Liberty Victoria, Refugee and Immigration Legal Centre Inc, the Justice Project, the Office of the Commonwealth Ombudsman, the Department of Immigration and Citizenship, the Centre for Human Rights Education at Curtin University of Technology, Centrecare, Project SafeCom, Southern Community Advisory Legal and Educational Services Community Legal Centre, the Uniting Church in Australia, the Australian Security Intelligence Organisation, the United Nations High Commissioner for Refugees, the Asylum Seeker Resource Centre, the Australian Human Rights Commission, Get-up!, the Human Rights and Equal Opportunity Commission, Legal Aid New South Wales and the Service for the Treatment and Rehabilitation of Torture and Trauma Survivors. All in all, the committee actually took over 139 submissions from various individuals and community organisations. These organisations gave evidence regarding the concerns of refugees and the burden and punitive impact of detention debt experienced by those refugees and their families. I point out these are people whom we have found to be genuine refugees. We should remember that these people left their homes, fleeing from prosecution and violence, and were often traumatised by their journey here to Australia. Under the act, a noncitizen who was detained by the Australian government is liable to pay the Commonwealth the cost of his or her immigration detention and, where applicable, that of their families. The debt began to accumulate as soon as they were placed in detention. Initially, this provision was intended to be a cost-recovery measure by the then Minister for Immigration, Local Government and Ethnic Affairs, Gerry Hand. At the time of its introduction in 1992 by the Keating Labor government, the intent of the provision was to ensure that all unlawful noncitizens would bear the primary responsibility for the expenditure associated with their detention. Specifically, section 209 of the act was introduced to minimise the costs to the Australian community of the detention, maintenance and removal or deportations of unlawful noncitizens. A further objective of the policy was to require former detainees to pay their detention debt to Australia, or make arrangements for repayment, as a condition for the grant of a visa for lawful re-entry into Australia sometime in the future. This objective was the subject in provisions under the Migration Regulations 1994. This particular provision was not only punitive but also a curious policy, in that it actually set up a financial barrier that effectively prevented ex-detainees who may have wished to follow the appropriate legal mechanisms to migrate to Australia sometime in the future. This prevented them from doing so. The detention debt against their name acts as a real barrier to their lawful application. So this can be seen as a confusing policy. If we want prospective immigrants to make a lawful application to come to Australia, why should we make it even harder for people to follow the lawful process? Under the policy as it stood, costs of detention were recovered only once the detention was ended and total costs were calculable. The exceptions were if a person in detention chose to pay these costs, partly or in full, before release or if their valuables had been seized and applied towards the payment of the incurred costs. The evidence clearly indicates that the imposition of detention costs is an extremely harsh policy and one that is likely to cause significant hardship to a large number of people. The imposition of a blanket policy without regard to individual circumstances is inherently unreasonable and may be so punitive in some cases as to effectively amount to a fine. The committee agrees that it is a serious injustice to charge people for the cost of detention. This is particularly so in the case of unauthorised arrivals, many of whom have spent months and years in detention ... the committee therefore recommends that it be abolished and all existing debts be waived. The Senate committee recommended that the imposition of detention debt be discontinued except in instances of abuse of process or where applicants acted in bad faith. That was in 2006. Last year, the Joint Standing Committee on Migration found that there was consensus of opinion condemning the policy as punitive and discriminatory. I remind the House that we had significant organisations giving evidence to the committee. We also found that submissions to the committee expressed concerns regarding the impact of detention debt on ex-detainees and in particular the burden on mental wellbeing, the ability to repay the debt and the restrictions a debt could place on options for returning to Australia on a substantive visa. Our 2008 committee also noted the detrimental flow-on effects for families and dependents and the ability of people to progress their lives once in Australia upon release from detention. I point out that the debt was imposed upon people who we Australians had decided were indeed genuine refugees. We made it very onerous for these often traumatised families to make a new start here in Australia. We burdened them with debts to begin life in their new country and these debts often amounted to hundreds or thousands of dollars. In addition, this provision also proved to be difficult for government to administer. The committee noted that less than 2.5 per cent of the detention debt invoiced since 2004-05 had been recovered, with the vast majority of debt having been waived or written off as unrecoverable. It became clear to our committee that this provision, which was initially a cost-saving device, could not fulfil its original intent. Our committee concluded that the practice of applying detention charges would not appear to provide any substantial revenue or contribute in any way to offsetting the costs. In practice, recovery of many detention debts was not pursued but waived or written off. When a debt is written off, this means that a decision is made not to pursue recovery of the debt. However, at some time in the future the Commonwealth could choose to execute debt recovery. When a detention debt is waived, the debt is extinguished. Under the current arrangements, an unlawful noncitizen in immigration detention is charged a daily set maintenance amount for the entirety of their detention. As at June 2008, the charge per individual, including spouses and dependent children in migration detention, was $125.40 per day. Unlawful non-citizens who are removed or deported from Australia are also currently liable to pay for the cost of their removal, but this will remain unchanged. In the financial year 2008, nearly $3.5 million of detention debt was waived for 140 formers detainees. Write offs were much more commonly employed, however. For the same period, just over $19.2 million was written off for 1,743 individuals formerly in detention. In the last four financial years, 495 individual debts amounting to over $6 million were waived. For the same period, 10,580 individual debts amounting to just under $133 million were written off. In the last four financial years, a total of 17,355 detainees were invoiced with detention debts amounting to a sum of just over $170 million. The total amount of debt recovered since 2004 has remained disproportionately low-- between one and four per cent of the total debts incurred. Since 2004-05, less than 2.5 per cent of the detention debt invoiced has been recovered and in 2007-08 only $870,000 of $23 million of incurred debt was recovered by the government. While figures are not available for the annual administrative cost of assessing which debts will be written off or waived or for the cost of debt recovery for Department of Immigration and Citizenship and the Department of Finance and Administration, it is expected that the cost is significant. The Minister for Immigration and Citizenship has said that it seems that the cost of administering the scheme to collect the debt either outweighs or is close to a break-even point in terms of the money brought in. It seems to be a crazy situation to run a system to collect debt when it costs us as much to collect the debt as it does to generate income from it. As a cost-saving measure, the policy of charging detainees the cost of their detention has not delivered on its purpose. It is a further argument that this onerous provision should be repealed. The committee heard a range of criticisms through the inquiry, particularly from the many community organisations that provide assistance and give support to migrant families and refugee families. Many condemned the provisions as punitive and discriminatory and many pointed out that they added to the trauma for people in detention and their families. Many described the provisions as being manifestly harsh and unjust and many pointed out that they caused unnecessary financial hardship to people struggling to establish themselves in Australia. Further, we learnt that Australia appears to be the only country in the world to put costs for immigration detention upon detainees. Yet, as we have noted, the practice of applying detention charges does not provide any substantial revenue or contribute in any way to offsetting the cost of detention. As we have pointed out, it is likely that the administrative costs outweigh or are approximately equal to the debts recovered. As a cost-saving measure, this provision has clearly failed. The evidence before the committee also indicated that the imposition of detention costs is an extremely harsh policy and one that can be shown to have caused significant personal hardship to a large number of people who are trying to make a new life for their families in Australia. At this point I would like to acknowledge the work of the Liverpool Migrant Resource Centre in my electorate and to acknowledge the leadership of Kamal and his dedicated team as they work to assist many new immigrants and refugees settle in my own local community area. It is also seen as a serious injustice to charge people for the cost of detention. This is particularly so in the case of those unauthorised arrivals who have spent months and years in detention, often after being traumatised by the experience of their journeys to Australia as they fled from persecution and violence. Some in this place have put an argument that this provision should be maintained because it acts as a deterrent to potential unlawful arrivals in the future. However, during the course of the inquiry this was shown not to be the case for the simple reason that unlawful arrivals were not aware of the provision. Indeed, there were many members in this parliament who were not aware of these provisions until the advent of this amendment bill. I wish to make this point clear for the benefit of my constituents. This provision under division 10 part 2 of the act was never intended to be a deterrent. It was purely a cost-saving measure of the Keating Labor government and it has never worked as a cost-saving measure, as we have seen--it costs more in administration to try and recover the debt than the debt is worth. This provision has never worked as a deterrent, either. It was never intended to be a deterrent. Potential refugees and unlawful arrivals never knew about possible detention costs. Therefore, it could not have been a deterrent. Deterrent measures are by necessity frontloaded at the beginning of a process. In this case, the detention debt was one of the last measures unfairly imposed upon unsuspecting illegal arrivals, many of whom were later found to be genuine refugees. It was never intended to be a deterrent and it certainly has not worked as a deterrent since its inclusion in the act in 1992. The Joint Standing Committee on Migration called in its report for: the practice of charging for periods of immigration detention to be abolished; all existing debts, including those of people who have entered into arrangements to repay debts, and all write offs to be extinguished, effective immediately; the movements alert list to be amended to reflect these changes; legislation to this effect to be introduced as a priority; and every attempt to be made to notify all existing and exdetainees with debts of these changes. I wish to make it clear, again, to the people of my electorate: how people come to this country is one issue; how we as Australians decide to treat them when they get here is entirely another issue. I am delighted to support the amendments to repeal this legislation. This has been an unfair provision since 1992. As I said, it is an unfair provision and the amendments repeal the detention costs and waive the existing detention debts. I support these amendments because they are fair, they are just and their repeal will give those Australians, those families, those men and women who have come to this country to start a new life--those people we Australians have found to be fair dinkum refugees--a fair start in their new homeland. I support these amendments because they reinforce the values that, to me, uphold what it is to be an Australian. I think one of the good things about Australia that unites us all, and that makes us proud to be Aussies, is that we do believe in a fair go. We do believe in playing fair, in being fair dinkum to others and in giving people that fair go and a fair start. These are sound amendments. This bill is good policy and I warmly commend it to the House. Mr BROADBENT (McMillan) (12.26 pm)-- Before I begin my remarks on the Migration Amendment (Abolishing Detention Debt) Bill 2009 I would like to send my best wishes to Dr Mal Washer, who is in a Canberra hospital today after emergency surgery on his appendix. So we send him all the best. I know he would be sitting here beside us right now if he could be. The DEPUTY SPEAKER (Mr AJ Schultz)--I thank the member for McMillan for that kind thought. I am sure that all members in this House wish Dr Mal Washer all the best for a speedy recovery. Mr BROADBENT--I know he will be listening now and will have just heard the contribution from the member for Mackellar. People who are listening to and watching this broadcast would know her better as Bronwyn Bishop. I stand in total opposition to the presentation that the member for Mackellar has just given. There would be many who would ask, ' Why would it be that Russell Broadbent and Bronwyn Bishop are at odds when the member for Mackellar is a friend, a parliamentary colleague and, more than that, a warrior in marginal seats who proudly boasts that the only time he wins his electorate is when she has been involved in the campaign?' It is because I find that this legislation was wrongheaded when it was introduced by Gerry Hand as the then minister in the Keating government, not the Hawke government--let us not blame Mr Hawke for things that he did not do. I find the repeal of these laws by this legislation right, just and the right thing for this parliament to do. It is very difficult to oppose your own side. I did that once before, hoping never to have to do it again. There is a process that I have to undertake with regard to doing this. I have to go to my leader and say, 'Leader, I cannot support you on this bill.' I have to tell my leader that I think this bill is merciless, unfair, unjust and ineffectual. As the member for Mackellar has just stated, the figures do not add up. I am from a business background and I know that when it costs you more to collect the debt than the price of the debt you do not pursue it. This parliament should not be pursuing these debts. This legislation has come out of a process of this parliament, but I will speak to that in a few moments. Then, after I have been to the leader, I have to go to my whip and explain that I will not be supporting this legislation. Then--the hardest thing of all--I have to go to my party room and stand before my friends and colleagues, who, along with the rest of the people of this nation, I have the highest respect for, and tell every one of them that I cannot support them on the position of the leadership. In the great Menzies tradition, I can do that. In the process of speaking to my whip, the member for Fairfax, Alex Somlyay, said to me: 'Russell, you passed this legislation. You voted for this legislation in 1992.' What do I know of 1992? A lot. I remember 1992 very, very well. All I would have heard of that legislation when it was introduced by Gerry Hand, the minister, would have been the motion 'that this legislation be moved for a third time' and it going through on the voices. God forgive me that I was part of the parliament that did that, which caused so much distress to so many families over such a long period of time. It was wrong in the Hawke years and it was wrong in the Howard years, and the wrong will be righted today. The debts against some of our most vulnerable people will be removed, will be waived. It is the Australian thing to do. It is about fairness, justice and rightness. In 1992, Victoria was a basket case. Australia had just removed its most popular Prime Minister ever in Bob Hawke. I stood on the other side of this parliament with a senior minister, a friend of mine, who was in tears that his Prime Minister was being replaced. It was a time of high drama, very similar to now, except that, in my electorate of Corinella, 30 per cent of the kids could not get a job, 20 per cent of the population could not hold on to their job, mortgage rates had soared to 18 per cent and interest rates for small business were 22 per cent. Yes, I remember 1992 very, very well. We were in the midst of a war in the Middle East--does this sound familiar?--we were in a major recession and there were major issues. Is this a big issue for this nation? No. Compared with what is happening today in this House and what has happened and is happening around the world, it is nothing. But what is it to the people that it affects? It is everything. It is their wellbeing and, to many, it is their honour--after all they have been through and all the detention, we give them a bill! Goodness gracious! I remember 1992 very, very well. In remembering my time in this place before, I remember that I also stood up in my party room around that time and suggested to John Hewson some thoughts on the politics of Fightback! and where we might end up. That was then reported by Laurie Oakes in the Bulletin, and I was called to account for those remarks. I was called to 104 Exhibition Street in Victoria, to the state director's office, where for one hour I was thrown around that office. What he was talking to me about was party unity, sticking behind the leader and doing the right thing. Do you know who that state director was--do you have any idea? That state director was Petro Georgiou. This is very hard for us to do. It should never be misunderstood--when we stand in a place like this to oppose our own party, we do it with great regret and great grief. But when there is a bigger issue that the nation needs to address, an issue that the soul of the nation needs repealed--the something that was that should not be--then it is time to state your case, as I have. If you want a forensic analysis of this issue, go to the member for Kooyong's speech. It is all there. If you want a heartfelt analysis of the issue, go to Judi Moylan's address of last night. If you want to know how this came about, go to the speech of the member for Hughes, Danna Vale, of last night, and look at the forensic work of both committees but especially the most recent committee. Look at the evidence of the people that addressed that committee, and remember that committee proceedings are equal to the proceedings of this House. You cannot go into a parliamentary committee and mislead that committee. Important issues are raised, and issues are worked through methodically, usually with a brief from a minister. I said before I have high regard for the members of this House, and all of the Australian people also have my respect. That is why, when I stand in this House and talk about these issues, I know that my colleagues on both sides of the House and in the Senate have closely looked at this issue, and they came up with a recommendation on the part of the parliament. Mr BROADBENT--It was a bipartisan statement, and that bipartisan statement said, 'This should be removed; this part of the legislation should be repealed.' They did not do it lightly. Last night, the member for Hughes listed all of the people that the migration committee spoke to and she acknowledged the interests and exchanges that she had as a member of parliament on that committee in coming to the position that she came to--out of the experience of speaking to the people that this either directly or indirectly affected. It is a process of the parliament that that committee report was picked up by this government and brought into this House for legislative change. Members of this House, I feel like I am standing on solid ground because I am standing on that committee report. My personal feelings on this issue are probably well known by all, but this legislation has come out of sincere hard work and deliberation by a committee of this House, and it decided on all reasonable terms that this is the right way to go on this issue--Immigration detention in Australia: a new beginning. I do not have to go through the arguments, because I sat here when Peter Costello stood in this House just the other week and, to the applause of the chamber, told us just how important it is to be a parliamentarian, each individual; the responsibilities we have to the nation; and how this parliamentary process is important. We have been reminded recently that we are one of the oldest democracies and we have been reminded that, among all of the blessings of this nation, we have stable government. We saw the government change in this nation without one shot being fired and with hardly a word in anger. This is where we have our word in anger; this is where we confront the issues of the day. That is why I stand today to support the government on this issue. I do not expect all of my colleagues to agree with me on any issue that comes up. But, on this issue, I have form; I will admit that. I have form, and I have never been more proud of that form or of those who walk with me on that road. There have to be some that will stand up for the most vulnerable in our community and consider their position, whoever they are, and the fact that they are Australians, however they have come to contribute to this House. So there is a reason why I remember everything that has happened to me in this place and who I have walked with and where we will go together. But most of all I am here today to see this legislation go through. I will watch it go through the Senate. And I will see people, Australians, relieved of a burden that should never, in the history of this nation, have been placed on them in the first place.